I don’t know about you, but I’m always stuck on what to get my boyfriend for a special day like our dating anniversary or Valentine’s day. Guys have it so easy: Buy flowers, sign a card, rinse and repeat. But my guy hates cards. And I don’t think he appreciates P.D.F. (public display of flowers) quite the same way that I do. So when his birthday rolled around this year, I decided to scrap the bouquet and go for a broquet. 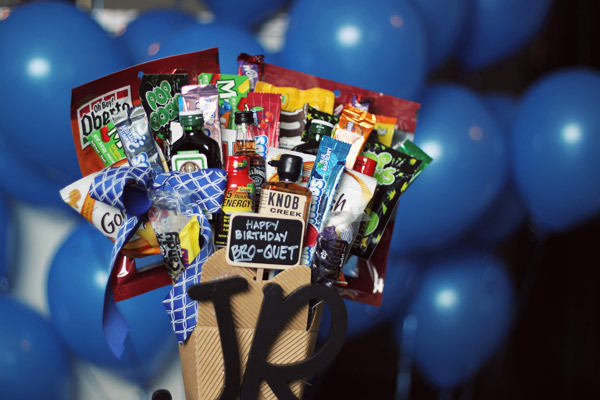 The bro-quet is like a bouquet’s manly, DIY counterpart. Just like a gorgeous floral arrangement, this crafty gift has major “Wow!”-factor when you leave it for him to find, or drop it off at his office. But instead of flowers and greens, he’ll get to enjoy eating and drinking his favorite candy, liquor and snacks. What more could a guy want? The best part is that it’s easy to make. Cut down your your floral foam so that it fills your container. If your container is light (like mine was), you may need to weigh it down with pennies or another small, heavy item before filling it with the foam. Take your bro-quet goodies and attach a stick to the back of each one with hot glue. Try to vary the lengths of the sticks; bigger items like beef jerky should go in the back on longer sticks, smaller items like the liquor bottles are in front on shorter sticks. Once you’ve got everything attached to a stick, begin to push each stick down into the floral foam. This is where you put on your ameteur florist hat and try to arrange everything in a way that shows off each item and gives the bro-quet a nice round shape. Finish off the bro-quet with embellishments like wooden letters, tissue paper or ribbon (either wrapped around the bro-quet, or attached to another stick like I did here. 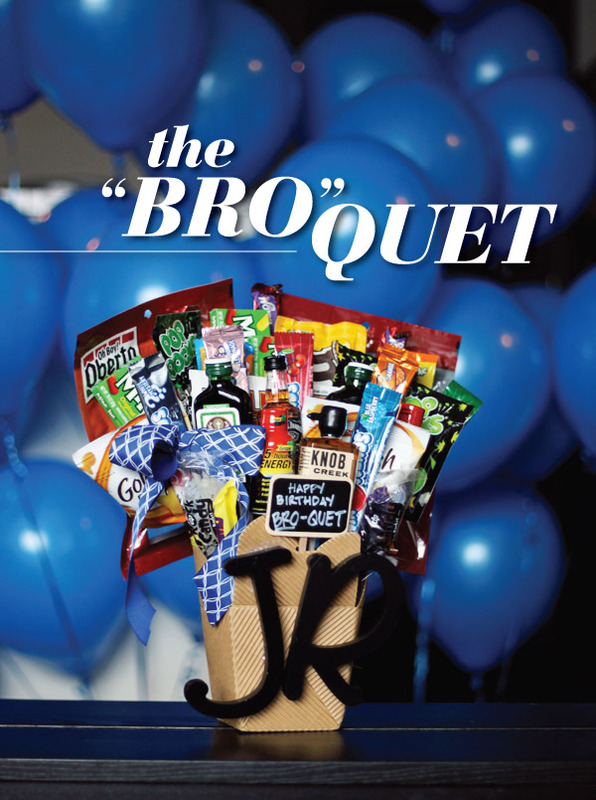 The bro-quet makes a great gift because you can completely customize it to your man’s tastes. Does he love beef jerky? Chocolate covered pretzels? Whiskey? Sour gummy worms? Snickers? And you don’t have to stop at the edible. Try adding golf balls, fishing lures, DVDs, gifts cards, video games, or anything else you know your guy is into. Happy snacking and happy crafting! This is awesome. I’m definitely doing this! AMAAAAZING !!!!!! Now please do an equivalent for us guys to get our girls please ! Where did you get the little chalk board sign?